The cold weather is in full gear and allllll the winter foods are here! During the winter all the squashes come out to play. Last year I was all about the butternut squash and shared my butternut squash risotto recipe, here. Today it is all about the Acorn Squash! Acorn Squash, otherwise known as Pepper Squash or Des Moines Squash is another winter squash with a yellow-orange interior. Its exterior consists of little ridges and most people mistake this squash for a decorative gourd. 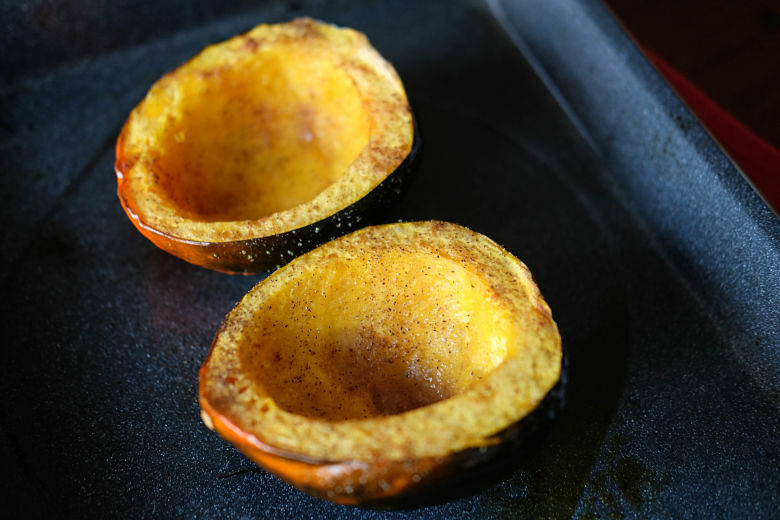 Acorn squash are usually slightly nutty and sweet in flavor and can be cooked a bunch of different ways! You can crockpot this baby, roast it, microwave it, puree it, stuff it, glaze it…..the list goes on. For my recipe I kept it low key by simply baking it in the oven. First I started by cutting in to the Acorn Squash and scooping out the “gunk,” as I like to call it and the seeds. Acorn Squash aren’t as tough to get into like Butternut Squash, but either way I would try to use a chef’s knife. Once you’ve removed all the gunk and seeds go ahead and remove the stem off the squash. Next, prep your oven. Get it all nice and warm with a pre-heat and line your roasting pan with aluminum for easy clean up. Now it’s time for the fun stuff; dressing up your squash! Drizzle it up with some olive oil, salt, pepper and any other seasonings you may like. I added a little garam masala…you know I had to Indian-ify this dish somehow. The garam masala brings a nice warmth to the dish with the elements of baking spices with a touch of spicy heat. Little slivers of garlic would be yummy with this dish, or even some brown sugar to get it caramelized. Great, now all I want is more acorn squash. This makes for a great side dish or even a main meal if served up with side salad. Keeping today short and sweet with ya! Cut squash in half and remove stem and seeds, leaving a clean middle. Rub squash halves down with 1 tbsp. oil on the inside and outside. Sprinkle with salt, pepper and garam masala. Roast in oven, squash side up, for 45 minutes, or until easily poked through the flesh. Jazz up more with herbed butter, brown sugar, cayenne. This looks so delicious! I definitely want to try this! Omg can we just get together already so I can try all of your delicious food!?! Acorn squash is my faaave! Yumm! Happy Monday! YAS PLEASE!! Come to Boston!!! Awesome! Glad this came just in the nick of time! Wow ! This is such an awesome recipe ! I was looking for something simple and healthy but also special for Thanksgiving so I will definitely try it. Thank you so much! Oooo this would be great for Thanksgiving! OMG first I got distracted when i saw your link to the risotto recipe…uh yes please! Ok now back to this squash. I will buy this when i go to the store this week . I am so excited to try it! Try them both! I want to see the end result Marisol!!! Haha! I love that you say you had to Indian-ify it! I love acorn squash and am definitely saving this recipe for next Monday! Never having heard of it, I love the fusion of cultures you have going on there and would love to try this recipe. I mean, you make it look simple, but I wonder if I actually would have the talents for it. Haha 🙂 Thanks for sharing a lovely recipe!